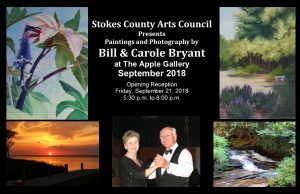 Stokes Arts welcomes artists Bill & Carole Bryant to the Apple Gallery with an opening reception on Friday, September 21, 2018 from 5:30 to 8:00 pm. This joint exhibition features photography and paintings by the talented couple. Bill enjoys landscape, candid and still life photography. His passion began as boy, developing photos in a small home darkroom with his father. After retirement Bill began studying digital photography and has since enjoyed participating in photography clubs and competitions in the area. Carole paints in oils, acrylics, watercolors and pastels. In her home studio in the foothills of the Blue Ridge, she strives to capture on canvas or paper fleeting moments in time. Inspired by her garden and the varied tapestry of North Carolina Landscapes, Carole hopes to engage the viewer with the scenes that inspire her paintings. Their exhibition will be on display beginning September 4th and will continue throughout the entire month at the Apple Gallery – 500 Main Street, Danbury, NC.